House is close to the ski lifts. From the windows can be seen the mountains and ski slopes. Not far from there is the bus stop. Parking, kitchen, Wi-Fi Internet, rooms with all conveniences. Half board is included. Pylypets, private house "At Yaslygan"
Private house in Pylypets village of Zakarpattia oblast is located near the ski lifts and tracks as well as the stop of the regular buses. It is 300-400 m to the lifts. From the windows can be seen beautiful view to Magura Mountain, to lifts, tracks. Nearby there is the waterfall Shypit, the ropeway, the lift; it operates in summer as well. Private house in Pylypets "At Yaslygan" is a two storey house; on the ground floor there is a kitchen, dining room, living room and bathroom. Living room and rooms are modern and comfortable. The house intends for 10 people. The first floor has five double or triple rooms, a toilet and a shower. The kitchen has all necessary utensils, a refrigerator, a microwave, a gas stove. Cold and hot water is 24 hours, self-contained heating. In the kitchen there is a microwave, gas stove, utensils and kettle. The cost of accommodation at Pylypets resort in private house "At Yaslygan" are set by agreement. Guests of the private house "At Yaslygan" of ski resort in Pylypets are offered two meals a day, the cost of it is included. The restaurant serves Ukrainian and Zakarpatiia cuisines. It is also possible to cook yourself. There is a cafe and a shop not far from the house. Dishes of meat, milk and baked goods are home-like as well as jams, stewed fruit (raspberries, bilberries). The menu also includes dishes of mushrooms. Two meals a day mean breakfast and dinner. Dinner in Zakarpattia includes the first course, main course, tea or something other. The owner of the house "At Yaslygan" will help with a ski instructor, ski equipment; in summer will show you mushroom places and bilberry bushes. There is also a possibility to cook on the grill barbecue and roast. 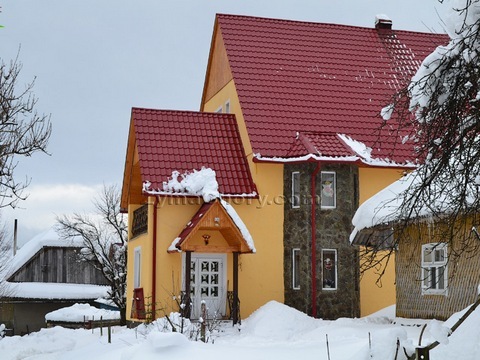 Private house "At Yaslygan" welcomes you to rest in the Carpathians!